SAN SALVADOR — Late one Sunday night in February, El Salvador’s secretary of culture alerted the world to a “cowardly and inhumane attack.” The perpetrators had used “severe and overwhelming blows.” A beloved national figure was gone. 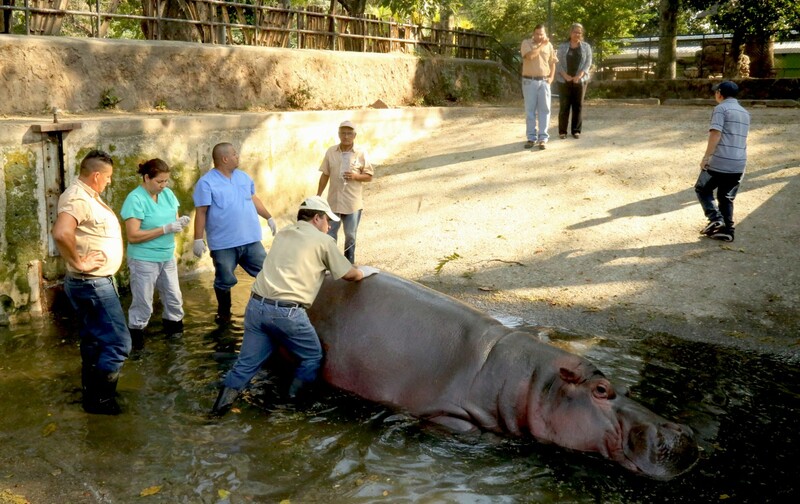 Gustavito, the lone hippopotamus at the National Zoo of El Salvador, had been killed. It takes a lot to shock El Salvador, one of the world’s most violent countries, but Gustavito’s death had done it. Tens of thousands of mourners streamed into the zoo, a leafy enclave in southern San Salvador, to pay their respects. The bereaved held candlelit vigils. When the environment secretary addressed reporters, she was in tears. Had gang violence gotten this out of control? “Forgive us, Gustavito,” one resident tweeted, reflecting the national shame. Within a couple of days, however, the first cracks appeared in the official story. Had Gustavito actually been stabbed in the snout by vicious assailants using an ice-pick-like weapon, as zoo director Vladlen Henriquez alleged? Or did the hippo get sick several days before, as anonymous zoo workers leaked to the local media, then lose the ability to eat and, with poor medical care, fall onto some sharp parts of his enclosure? Ricardo Amaya, the union boss for the zoo workers, could smell one thing. “There is negligence here by the zoo director and the veterinarians,” he told reporters. These initial suspicions soon twisted into more elaborate ones. Was Gustavito’s death part of a conspiracy to shutter the zoo, pushed by shadowy business interests who want to build some mega-project on the property? The El Salvador attorney general’s office was called in to investigate. Before the investigators could finish their work, however, news of more bizarre occurrences trickled out of the zoo. On April 23, five scarlet macaw parrots were stolen. Four days later, an 8-year-old puma, Soberana, died of intestinal trouble, the same day that a spider monkey drowned in a pond. Perhaps the strangest incident took place April 10,when the zebra died. Zoo authorities explained that an earthquake struck in the middle of a heavy rain, presumably spooking the zebra so much that it ran headfirst into the fence of its pen. The attorney general’s office seemed to discount the Gustavito murder theory, announcing that the animal died of a pulmonary hemorrhage. “You don’t see ice pick penetration, as was said initially,” one of the prosecutors said, adding that the wounds in Gustavito’s mouth could have come from his own tusks. San Salvador Mayor Nayib Bukele finds the zoo’s explanations of its mysterious deaths even less credible. After Gustavito died, Bukele proposed closing the zoo and relocating all 600 of the animals to a wildlife sanctuary in Mexico. “The zoo here . . . it’s depressing,” Bukele said in an interview. “We have a lion that has eaten his own tail. I’m not joking. Literally, he ate his tail.” He also cited a photo on social media that he said showed four monkeys with about 100 rats eating their food. The zoo is large and jungly, with a big lagoon where the spider monkeys romp in the trees, and rocky outcroppings for the tigers and lions. On a recent Saturday morning there were few visitors; since Gustavito’s death, visits have dropped by half. Born in captivity in 2002 at a zoo in Guatemala, the hippo was purchased for $5,000 by the El Salvador zoo two years later. When the zoo’s elephant died in 2010, Gustavito was the main remaining attraction. Gustavito lived in the herbivore section at the back of the zoo, in a grassy pen with several trees and a concrete bathing pool. He ate massive quantities of bananas, celery, spinach, watermelon and cucumber and spent a lot of time submerged. A two-story school and several houses border his pen, so if someone wanted to break into the zoo, this would be a good place to try. Henriquez, the zoo director, stands by his murder theory and denies any wrongdoing. In recent years, Gustavito, who weighed more than 3,000 pounds, had minor ailments and injuries, but he finished 2016 “apparently in good health,” according to a 23-page report prepared by the zoo. In early February, zoo staff noticed that Gustavito looked “pale” and “ashen,” the report said. He wasn’t eating well and was constipated. A team of veterinarians gave him medicine. His “rosy coloring” returned, the report said. Then, on Feb. 23, a zookeeper alerted superiors that Gustavito had not eaten his prior day’s food. He wouldn’t leave the water. Staff saw bruises on his eyebrows and jaw. When they coaxed him out, they noticed cuts and puncture-type wounds on his sides, limbs and inside his mouth. The stress had apparently disrupted his digestive system. His stomach was distended. He was unable to defecate, and he seemed in pain. Inside his pen, zoo staff found a three-inch piece of corrugated iron rod and several small stones, according to the report. Henriquez said they also found a hole in the wire fencing, suggesting that one or more people could have entered. “The animal had been attacked,” he added. Over the next few days, despite treatment and medication, Gustavito refused to eat. On Feb. 25, zoo staff noticed that he expelled feces from his nose, a sign he was severely obstructed, according to the zoo report. He was given a nasal catheter. He later lost coordination and fell off the lip of the pool. His breathing became labored. A Brazilian veterinarian, Rodrigo Teixeira, who happened to be in El Salvador when Gustavito got sick, defended the zoo staff. That is small comfort to the zoo’s regular visitors. Her sister, Veronica, agreed that Gustavito left a giant hole. “He was my favorite,” she said.